The name of the sending settings are listed here. The value of each setting can be edited by double-clicking on the corresponding cell in this column. Opens a dialog where a new setting can be defined. Removes the currently selected setting from the list. In the Sending settings, you can activate the setting "Archive sent emails". 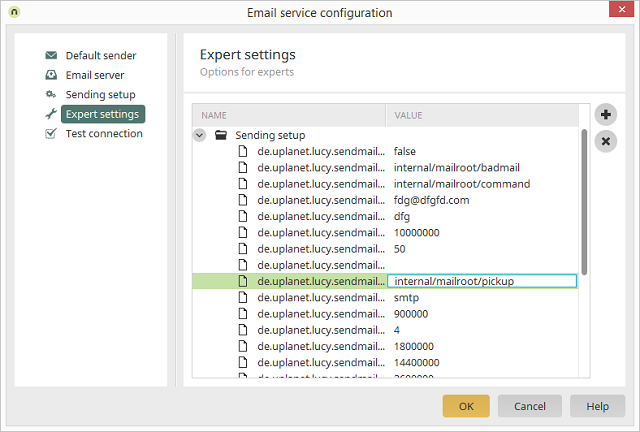 The directory, where the archived emails are saved, can be modified by double-clicking on the Value column for the de.uplanet.lucy.sendmail.sentMailDirectory setting.